CBC News has won the top prize for investigative journalism awarded by the Canadian Association of Journalists (CAJ) for its “Missing & Murdered: Unsolved cases of Indigenous women and girls” website. 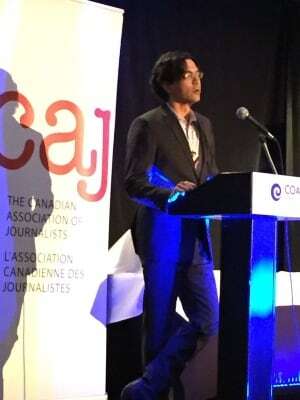 The Don McGillivray Award was presented to journalists from CBC’s Aboriginal news unit and other colleagues who helped develop the project at the CAJ awards gala on Saturday night in Edmonton. The website also won the Online Media category earlier in the evening. “In a year when Canada’s national media finally awoke to the tragedies of Missing and Murdered Indigenous Women, the work by our national public broadcaster set the standard,” the CAJ said in a news release. More than 250 unsolved cases, confirmed by CBC journalists, have been profiled on the website. Coverage of missing and murdered Indigenous women also garnered an award in the Open Media category for the Toronto Star. CBC won seven CAJ awards on Saturday for radio, television and online coverage. Other winners included CTV, The Globe and Mail, The Canadian Press, Maclean’s, APTN and The Brandon Sun. “It is a great honour for CBC News to be recognized with these CAJ awards which represents work from across our services,” said Jennifer McGuire, general manager and editor in chief of CBC News. “It is particularly gratifying to see our investigative digital project Missing and Murdered Women receive the top investigative award. This entry was posted in News and tagged Award, journalism, Murdered and Missing Women.